If you watched the Oscars last night and are at all interested in technology, then you know who the real winner was. Samsung. Not only did Samsung pay for four well-placed commercials during breaks, but their phones were everywhere throughout the show. 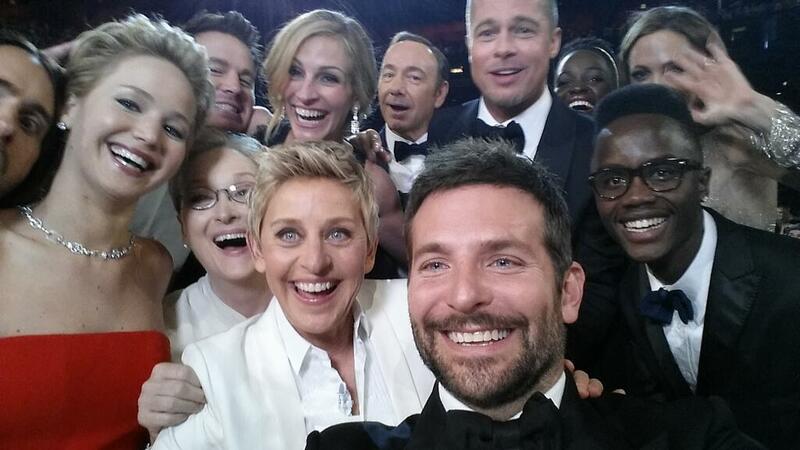 Host Ellen Degeneres pulled out Samsung devices a handful of times on and off stage, but the most memorable involved the Galaxy Note 3 and a “selfie” that is now the most retweeted Tweet of all time. Early in the show, Ellen dropped down into the audience, gathered up some of the biggest names in Hollywood (including Bradley Cooper, Jennifer Lawrence, Julia Roberts, Brad Pitt, Meryl Streep, Angelina Jolie, Kevin Spacey, and Lupita Nyong’o), and had Cooper hold out a Note 3 to take a picture (seen above) of the entire crew that would be Tweeted. It’s actually a pretty cool picture, but during the entire clip, the Note 3 is front-and-center and couldn’t be more well-placed. And yes, the Tweet featuring the photo taken has now been retweeted well over 2.5million times. There is marketing, and then there is what Samsung does. Love ’em or hate ’em, they are on some run here in terms of creating a brand. If you thought 2014 was the year that Samsung slowed, you may want to turn off your TV, not go to movie theaters, stop reading anything involving a celebrity, avoid sporting events, and bypass electronics stores.